Guyana, a country in the Northern Coast of South America bordered by Suriname, Venezuela, Brazil, and the Atlantic Ocean has a total land area of 83,000 square miles and a population of over 753,000. Guyana is also one of the few Caribbean countries which are not islands. Guyana has one of the largest unspoiled rainforests in South America, some parts of which are almost inaccessible by humans. Almost 80% of Guyana is covered by forests. Agriculture, bauxite, gold, timber, shrimp fishing, and minerals are the important sectors. 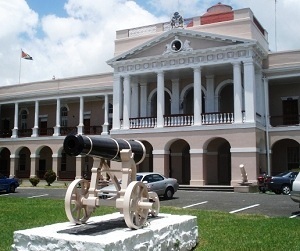 Value Added Tax (VAT) was implemented recently to improve Guyana’s standard of living as the government will have additional funds available for public spending. February through April is considered as the best time to visit the country. The major attractions are Kaieteur National Park, Shell Beach, Iwokrama Forest, the Kanuku Mountains and the historic Georgetown, St. George’s Church, Demerara Bridge and the Stabroek Market. Guyana’s cuisine is a marriage of East Indian, African, Amerindian, Chinese, Caribbean, and European cultures. The first stamps of Guyana were a set of six stamps released on May 26, 1966 that were overprints on British Guiana local scenes set of 1954. The set (Scott #1 to #6) catalogs for around $40 MNH and $60 used. The overprint reads “Guyana Independence 1966”. The original British Guyana set (Scott #253 to #267) is also highly valued at around $70 MNH and $35 used. The designs show botanical gardens, Victoria regalia lilies and jacanas, map, rice, sugar cane, Felling Greenheart Tree, bauxite mining, Mount Roraima, Kaieteur Falls, arapaima fish, toucan, dredging gold, and Coat of Arms. Sugar cane and bauxite mining are both pillars of Guyanese economy. The first set was followed by another set of fourteen stamps in the same theme in the 1966 to 1967 timeframe. That set (Scott #7 to #19) catalogs for around $20 MNH or used. A variety of the same set with a sideways watermark was also issued and those catalog in the same range. The first original issues of Guyana were a set of four stamps released on May 26, 1966. The set (Scott #20 to #23) is inexpensive and catalogs for around two dollars MNH or used. It was issued to mark Independence of Guyana achieved on that day. The designs show flag and map of Guyana along with Arms of Guyana. Guyana became a republic on February 23, 1970. A long set of sixteen stamps released between 1971 and 1976 showing Flora. The set (Scott #133 to #147) catalogs for around $20 MNH and $12 used. The designs show pitcher plant of Mount Roraima, hanging heliconia, annatto tree, cannonball tree, cattleya violacea, christmas orchid, paphinia cristata, gongora quinquinervis, tiger beard, guzmania lingulata, soldier’s cap, chelonanthus uliginoides, norantea guianensis, and odontadenia graniflora. More than 80% of Guyana is forests ranging from dry evergreen to evergreen rain forests. Its forests are rich with 8000 species of plants, about 1200 vertebrate species, and 1600 species of birds, over half of each are endemic. A strip of five stamps issued on December 3, 1984 showing swallow-tailed kite. The strip (Scott #917a-e) catalogs for around $20 MNH or used. The designs show pair in tree, landing on branch, in flight with wings up, in flight with wings down, and in flight with wings outstretched. Birds are a common theme on Guyanese stamp issues especially macaw. A strip of three and a set of four stamps released on November 7, 1985 to honor Cricketer Clive Hubert Lloyd. The set (Scott #1394a-c, #1395 to #1398) catalogs for around $6 MNH or used. The designs show Lloyd batting, portrait of Lloyd along with bat and wickets, cricket equipments along with the national flag, and Lloyd holding trophy. Lloyd captained the West Indies Cricket Team from 1974 to 1985. During his tenure, West Indies was revered for being a dominant cricketing nation with a fierce bowling attack and an attacking batting lineup. The first coinage of the area that includes present day Guyana were Counter-marked Silver Coins (3 Guilders = 12 Bits = 5 Shillings = 1 Dollar) on Spanish Colonial 8 Reales. The counter-marked serrated center plug were counter-marked 3 Bits while the holed 8 Reales were counter-marked 3 Guilders. The issues catalog well into the 1000s for XF. Colonial coinage denominated in Guilders debut in 1832. Some of the issues from the period have low mintage (~20,000) and catalog well into the 100s and 1000s. Republican Era Decimal Coinage was introduced in 1967 with the issue of Nickel-Brass Cents. These high mintage issues with a simple denomination within circle design in Obverse and Stylized Lotus Flower in Reverse catalogs for well under a dollar. Guyana has issued Dollar Proofs since the 1970s. Some high value gold proofs have very low mintage (100 or so) but still are remarkably inexpensive trading in bullion value range. Coins $1 and up Common Cents in BU starts around $1. FAO and other Dollar proofs from the 1970s onward starts around $10. High Value Boxed Commemoratives starts around $40. Dollar Proof Sets start around $100. Gold coins go well into the 100s. Paper Money $2 and up Common UNCs starts around $2. High Values and sets start around $10. Bundles start around $50 and go well into the 100s for high values. Jewelry, art, craft, leather goods, paintings, symbols and sculptures make good souvenirs for this country. Maps $10 and up 19th and early 20th century maps start around $10. 17th century original maps fetch well into the 100s. Art $15 and up 19th century local scenes art prints start around $15 and can go into the 50s and 60s for limited edition and older prints. Authentic leather art fetch well into the 100s and 1000s.